Memories of all sorts of papers, especially construction paper; pencils and trying to sharpen the pencils, lots of broken crayons, some without their wrappers; the white glue that you could peel off your fingers after it dried; messy water color trays and scissors that didn't work very well. Anything that could be attached to a paper or canvas whether it was the markings from a pencil or crayon, the colors from paint, or items such as buttons, leaves, and macaroni was called art supplies. It's how you use the items that make it an art supply item. 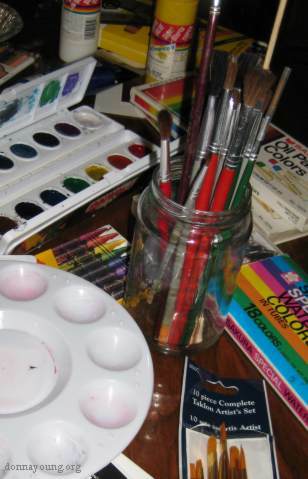 This section, Art Supplies, briefly discusses some of the items that your art student might need. Browse the links above. Many all purpose stores carry the basic supplies. Items such as decent drawing pencils, low quality paint, low quality paint brushes, paper that is good enough, those barely useful kid-friendly scissors, and if you want to use it, expensive fancy clays that air dry. When you need something else, such as a large pack of one color of construction paper, go to a school supply store or shop online. You will find that school supply stores have all sorts of art supplies and that one stop could be all that you need to do. If you do not mind paying more, go to a hobby store. Hobby stores that do not just cater to the handicrafts market might carry just about anything that you would need for art classes. Art supply stores are best when you need serious art supplies. By serious art supplies, I am referring to the type of materials that professional artists use. I use the two sites below the most for art supplies.